to paint all the vintage wire garden furniture I recently bought. I decided to try making a video, so this is what today's post is all about. and what I learned for those that might be interested. and it looks gorgeous out there this morning! This set was an old vintage set that didn't look so pretty when I found it on Craigslist. Now it looks amazing! See how I did it by clicking on the play arrow below. a great time "adjusting" to life back to before I had a shop. Woo hoo! cute cotton gardening gloves edged in pink binding. sends the message loud and clear. I love my home! And I am loving my life. 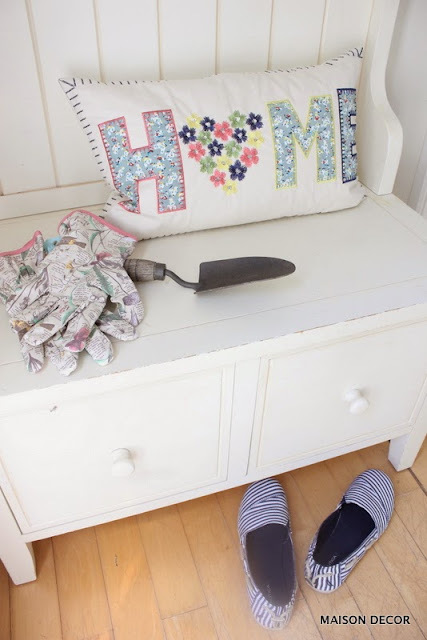 I feel so grateful that I get to stay home and be the homemaker and take the lead to creating a loving and happy environment for my hubby and kids that still live here. how cute is this small print that I hung above our hall tree? Our hall tree is laden with garden hats as I try to avoid the harsh rays. But my collection doesn't hold a candle to Mr. Maison Decor's hat stash. 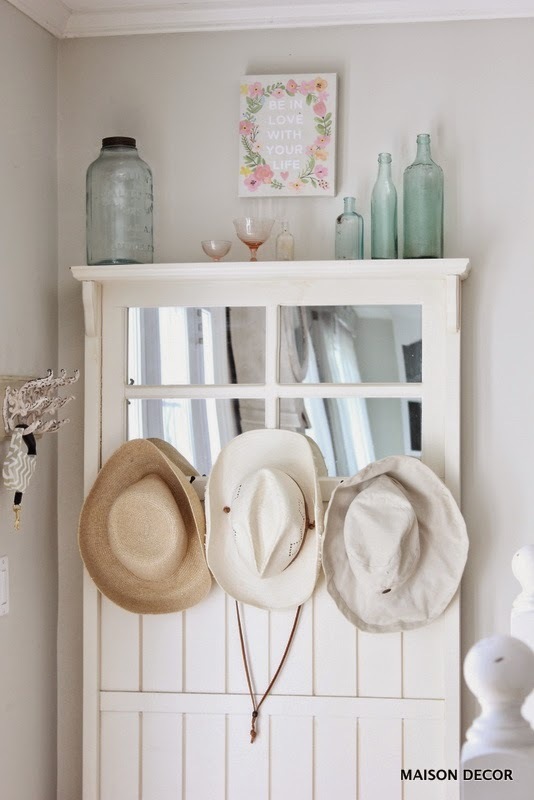 He has a whole room of Cowboy hats. Right next to our front door, our HomeGoods hall tree fits perfectly. 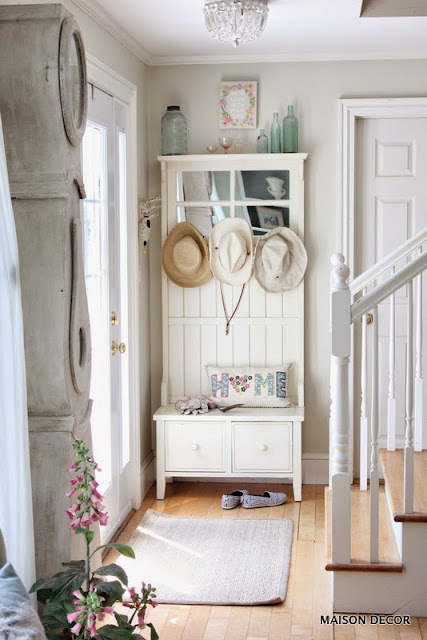 Its the place we keep dog leads and hats and a pretty pillow or two on the seat. We have the smallest entry area in the world but it still is worth making it look good. So if you are lucky to have a nice big foyer, I envy you that! If its small like ours, then these little touches are just enough to let others know we love our home. 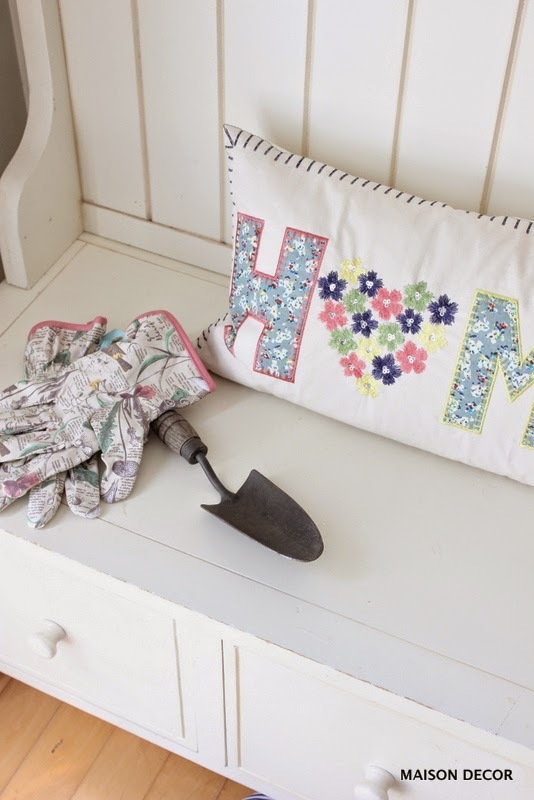 This adorable and happy little pillow is an appliqued gem shouting HOME! It couldn't be sweeter, and I think it just has such a joy de vivre. and I found this cute navy and white striped pair at Marshalls. Just in time for my trip to Newport! 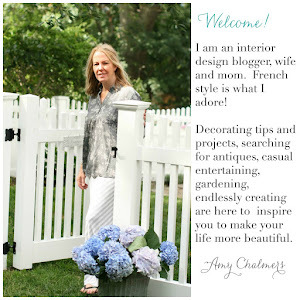 I am headed there tomorrow with my friend, Lydia Langston, who is an Annie Sloan stockist in Maine as well as the lady behind those amazing appliques, Efex! Lydia also shared the chateau in France when I was there last October. fresh ideas for making it into a charming rental spot for her summer tenants that are going to be arriving soon. Oh yeah, its summer time peeps! People are making vacation plans! After the brutal New England winter, it doesn't get any happier for me than summer coming. I will be back with a post on Newport, but I can tell you I am sure it will not disappoint. If you missed Tina's post on Newport, read it here. It totally put me in the mood!! 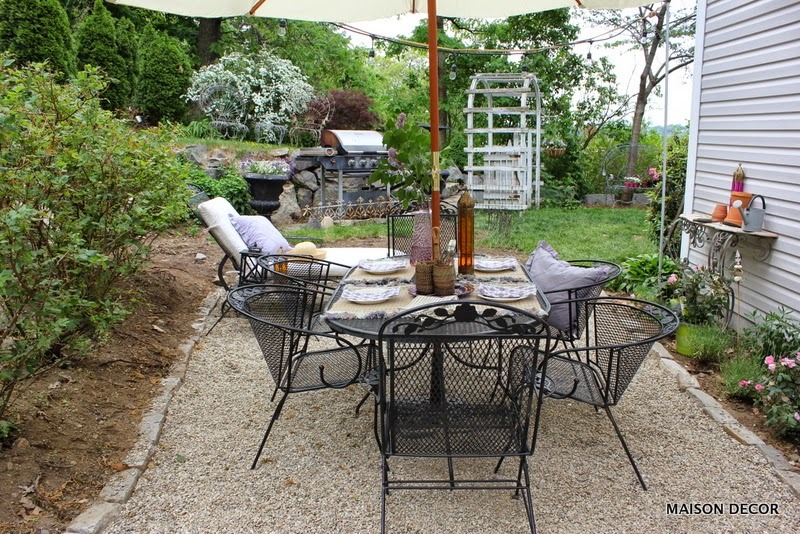 So if you have never been to Newport, Rhode Island, you will get the essentials from Tina of The Enchanted Home blog. 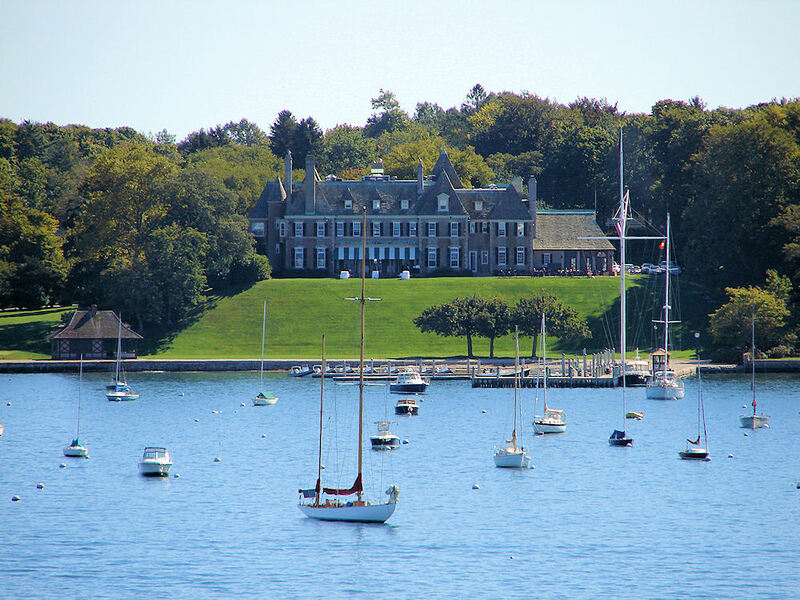 Of course she stayed in a lovely inn and all that fancy stuff, but I will just be making a day trip and maybe if I am a good girl, Lydia will take me to her Yacht Club for lunch. 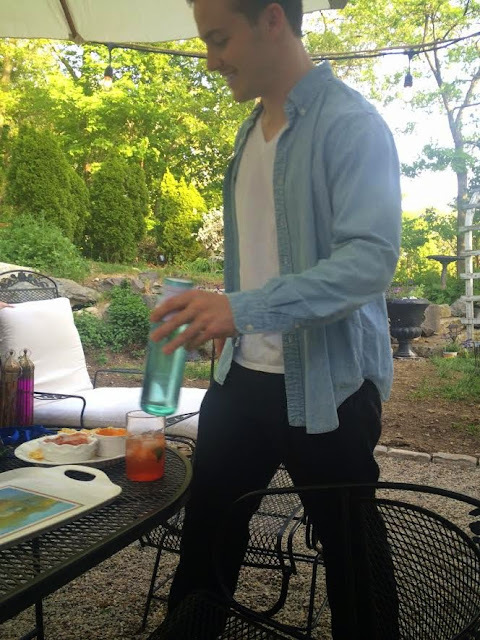 Post Script~Lydia did take me to the Yacht Club and boy was it lovely. No photographs allowed inside, but this is the driveway view of the front door. from Hoboken New Jersey. Its the most charming little Folly of a building. Check out the file photo of how this Yacht club looks from the water. Um, did I mention I love my life? This post was partially sponsored by HomeGoods as part of my participation in their Designer Pinterest board, Happy by Design. 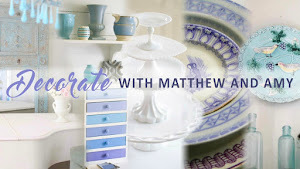 Welcome to a special blog post at Maison Decor. at the urging of one of my blogland compatriots. Most who read my blog know how I like to decorate my house with vintage and HomeGoods finds like I did above, or painting a piece of furniture or some other DIY project. But there is always more to somebody then meets the eye, isn't there? 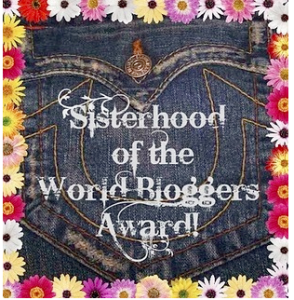 This award was bestowed upon me by someone in blogland that I truly admire. This person has crossed over from blogland right into my real life~its rare when that happens. 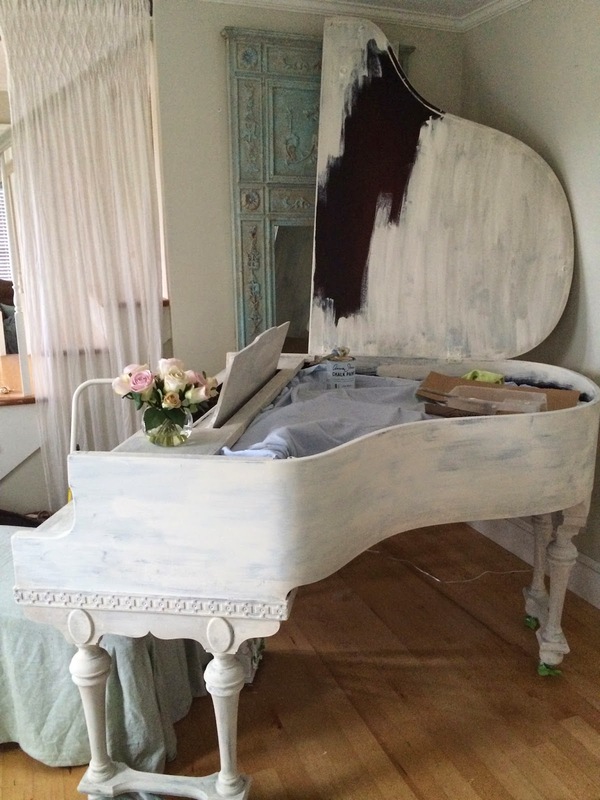 Yes, it's from Tina, of the mega block buster blog, The Enchanted Home. to see me twice. 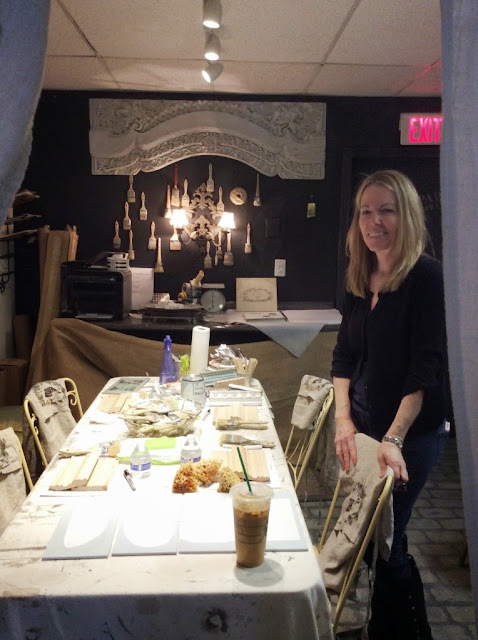 Once she made the trip to see our first shop after we opened in Boston, and the next time she came to see me at Maison Decor in Reading, and I treated her to a VIP one on one painting workshop. It was so nice to sit and chat with her, she is just an all around doll. Tina took this photo of me in my shop, the last time we met. (She declined my invitation for a shot together due to her camera shyness...someday Tina, someday....!) So without further delay, I will answer these ten interesting questions Tina chose to pose to her recipients upon acceptance of the Sisterhood award. Maybe there is a little bit here you didn't know about me. I have to say her questions were very fun to answer. 1. If you had to live in one country outside of the US for a year, where would you reside and why? I would live in Northern France. After visiting last year I fell in love with the French countryside and the moderate climes. France is truly a picture postcard, from the beauty of the simple country homes, to the stunning chateaus, the wonderful food and markets and the shops filled with cast off antiques of superior quality. I could be quite happy living in the French countryside. 2.What quality do you think most people admire about you? Most people might notice my drive and determination. If I get an idea, I usually find a way to get it done and get it done sooner than later. Like painting a piano or opening a store...but for those closest to me like my husband and sons, they would likely say its my loyalty and dependability. If I had a fantasy version of a last supper it would have to be in a French chateau that was in the countryside during the end of the summer. Family and best friends would be invited. My dog would be roaming around the grounds. The dinner would be outside in a lovely garden that was set up with white tablecloths. Candelabras and lantern light shed a soft glow, while a soft refreshing breeze wafts through the courtyard garden. Chandeliers twinkle from open windows inside the chateau as we gathered to dine. This would be an ode to summers end and we would revel in one last meal in the open air. Everyone who attended would be wearing linen trousers or dresses in shades of white and khaki. The menu? Fresh tomato, basil and mozzarella salad drizzled with balsamic dressing, escargot, a lovely Beef Bourguignon with fresh crusty baguettes and a creme brulee. A never ending bottle of a good Pinot Noir and perhaps some real French Champagne, since it was my LAST supper! 4. 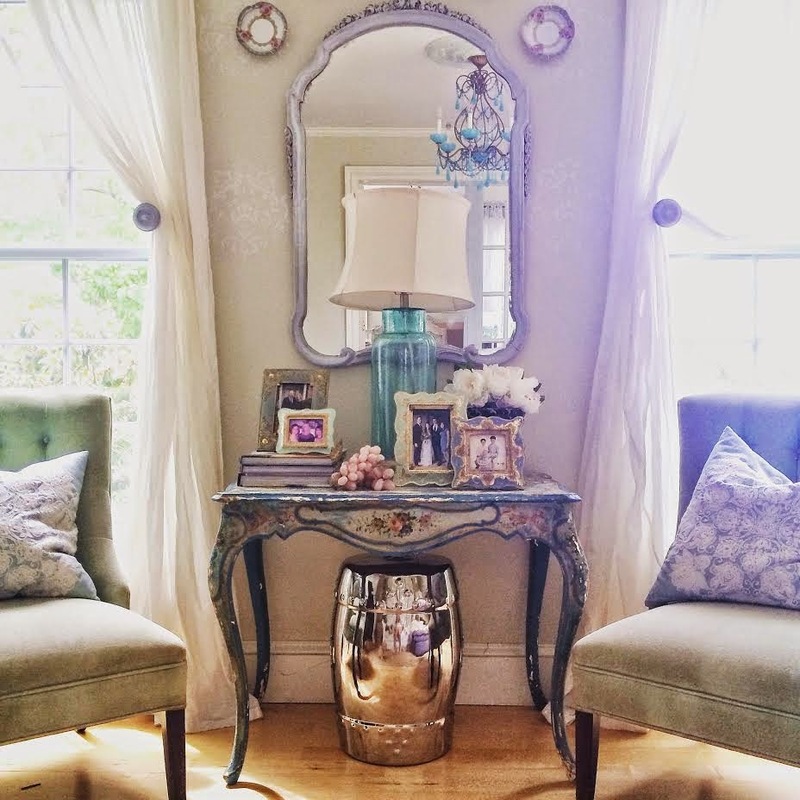 Your favorite room of your house and why? My living room is my favorite room because of a few things. It has the best natural lighting in the house, which I find so important. It has a super comfortable white slip covered sofa that I share with my dog Dillon when we are home alone together. Its color palette is relaxing in mostly white and bits of blue. 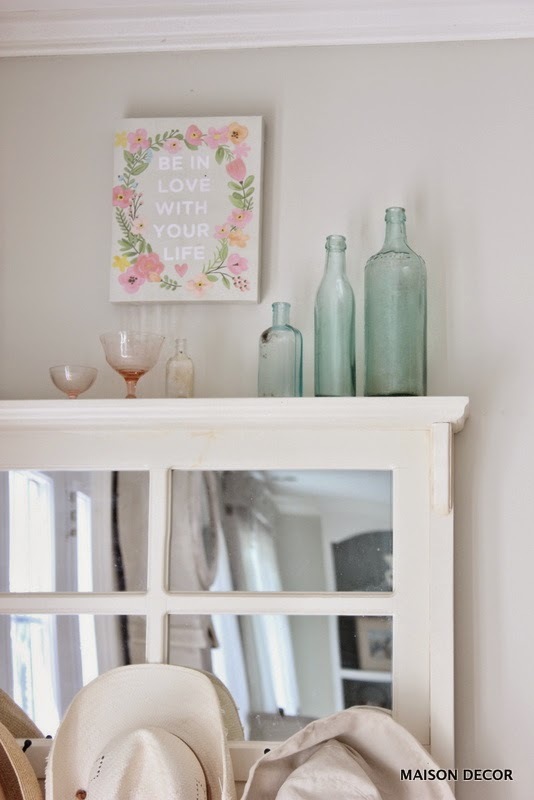 Some of my favorite possessions are found in here~ an old mora clock and a handpainted table. Its completely relaxing to me and I just love it. 5. If you had to be named something else, what would you name yourself? Go ahead an include a middle name while you are at it. That is a funny one...I probably would go for a longer name that could be shortened. My name is Amy Elizabeth, so not much you can do with the little name of Amy. I guess I would choose either Samantha (which could be Sam) or Katharine (which could be Kat). That way I could have the formality of a long name, but the fun of a nickname. I would choose a middle name that had some family heritage significance, and that would be Buck. My paternal grandmother, Olive Buck, was where I got my creative gene I believe. She was always painting or creating, and I have fond memories of her. So my chosen name would be Katherine Buck, or Samantha Buck. 6. Pick an all time favorite movie and an all time favorite book that you think we should all watch and read. 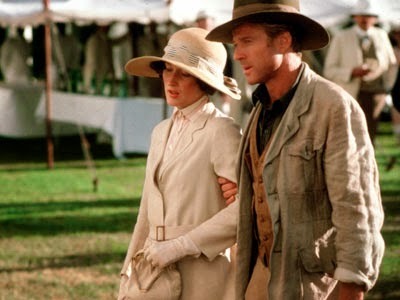 My favorite movie is Out of Africa starring Meryl Streep and Robert Redford. 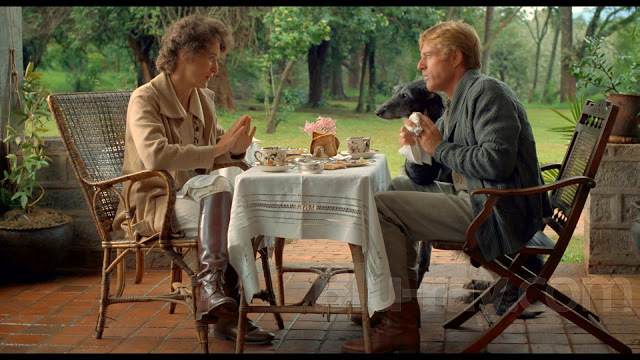 Its a sweeping romantic drama based on the real life story of Isak Dinesen. I think it won best picture and 7 Academy Awards and it has the best sound track as well. I loved how she moved to a foreign land and dragged her things with her and created a life for herself. A good book? I haven't had time to read a book in three years (my stint as a shopkeeper) besides decorating books. 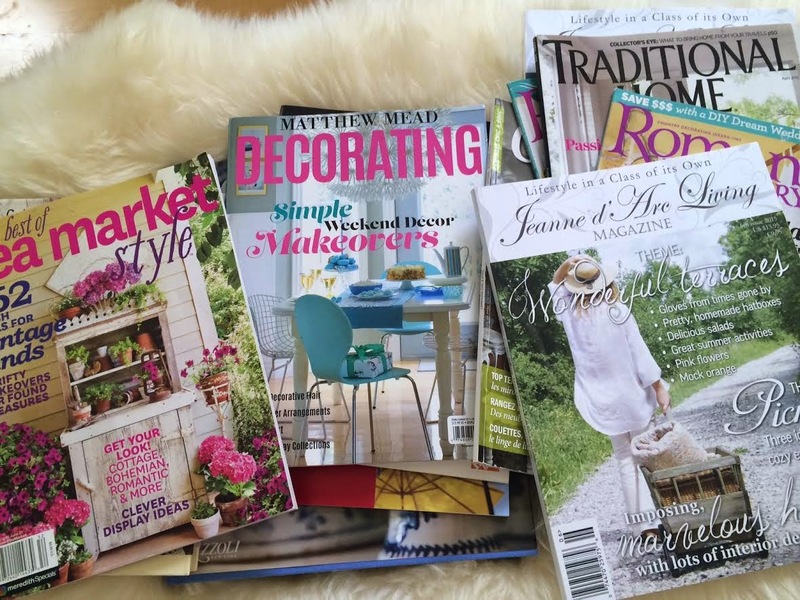 I read tons of decorating books and collect them. I am enjoying the Legend of Charles Faudree at the moment and its very good. 7. If you had to be born in one decade, what decade would that have been/be and why? I am pretty happy having been born when I was, although I love the romance of yesteryear, I think times were a lot harder than we have them now, unless to the manor born you were. So I will stay right where I am thank you. 8. A movie is going to be filmed based upon your life, who will play you and what will the name of this blockbuster be? And the real "us" ( taken on a trip to California last month). 9. Everyone has them...come on tell us, what is one of your guilty pleasures? 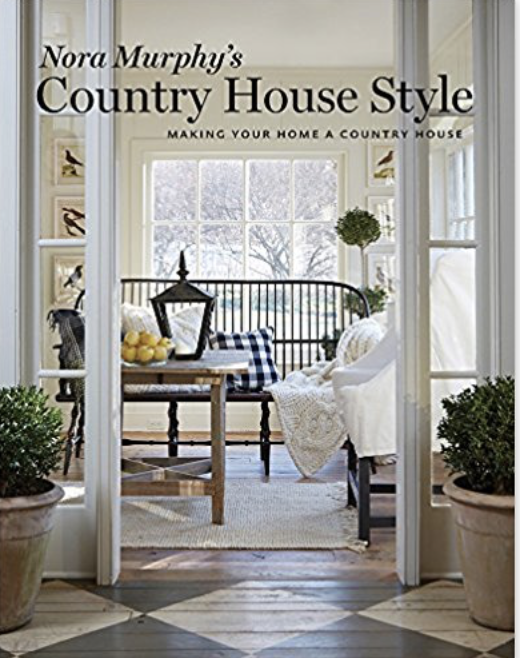 Buying home decor magazines. 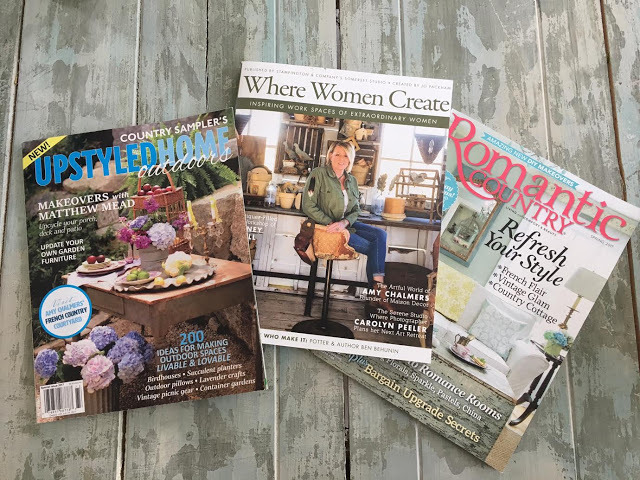 I love grabbing one of my piles of magazines and a glass of wine or cup of coffee, depending upon the time of day, and then sitting down and just pouring through image after image. I will never tire of the published page of a magazine. They fill me with ideas and spur many of my projects. I am not much of a TV person, but I love my magazines. And hey! 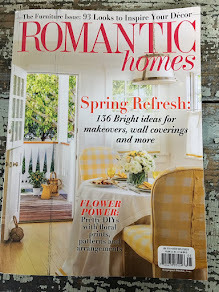 I am in one currently on the news stands, a 12 page feature of my home in Matthew Mead's DECORATING issue. What a thrill! Well my bucket list this summer is really big because I have closed down my retail shop. So that has opened up my list big time! Number one is to spend time at with my parents at their home on Martha's Vineyard. I love the whole vibe there, hitting the summer farm stands, reading magazines by the oceanside with a picnic, visiting my cousin's homes on the island and just plain old driving around that beautiful place on country roads on a perfect summer day~its just the best! 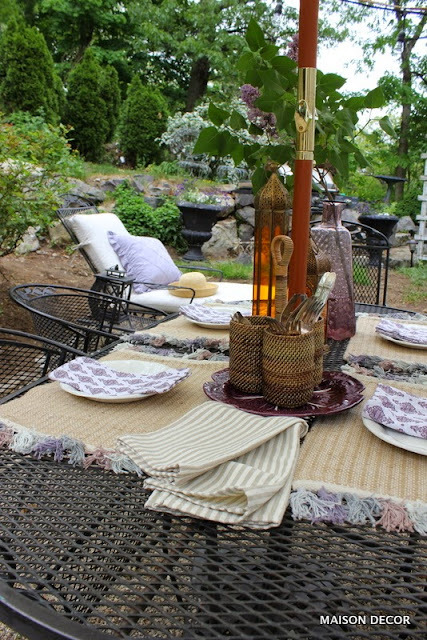 Another bucket list item is to create an outdoor living space for our family to use all summer long for al fresco dining. I have already started it, and I am loving how it is coming along! 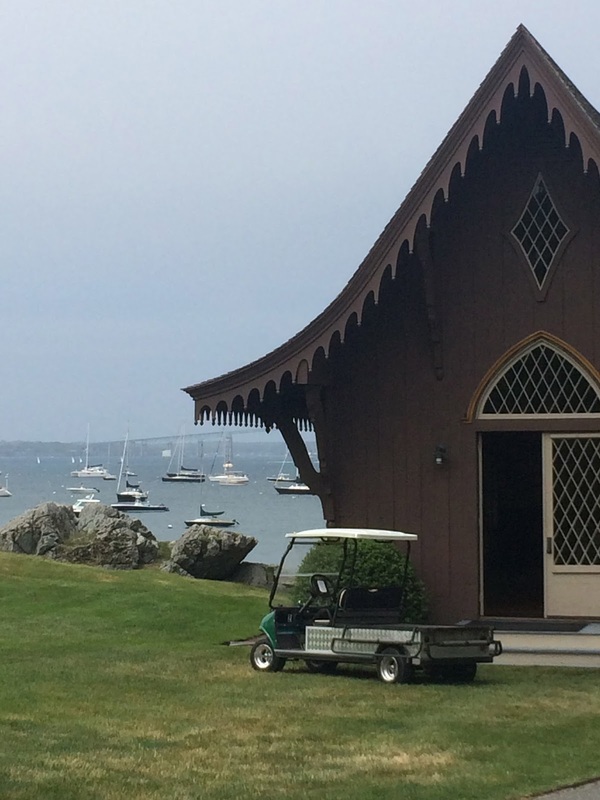 Visiting my sister's vacation home in Maine is also on my bucket list. 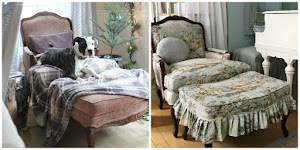 We love to go antiquing there and I like to help her decorate her home. So I guess its about family, my bucket list and now I have the time to enjoy that. Thanks for the chance to think about things maybe I wouldn't ponder Tina. You are a powerhouse of a person and I am so glad to call you my friend. Check out Tina's beautiful blog, The Enchanted Home here. She is one to watch! 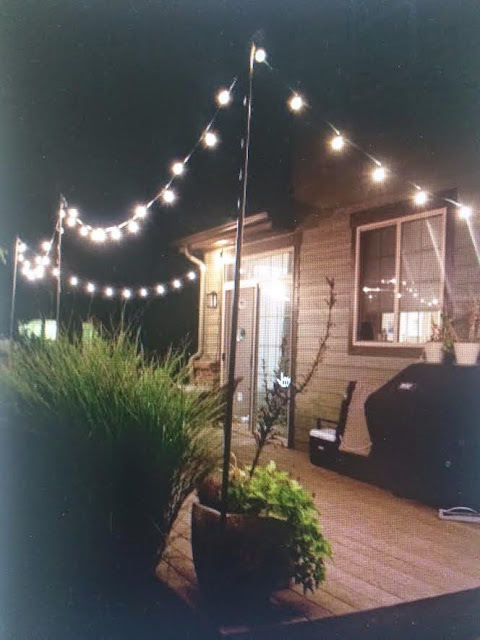 The big project of the weekend was getting our string lights installed around the courtyard. 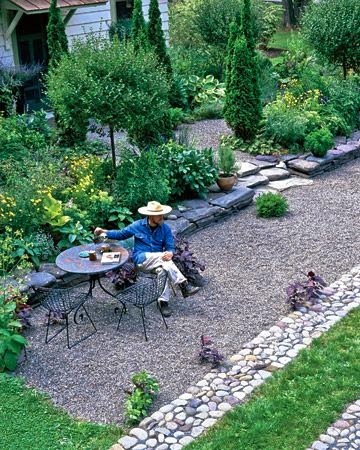 When last you saw the courtyard we were spreading out the pea stone gravel between the cobblestone border that would define our al fresco dining area. I just love how it looks, and what made it so awesome is how easy and fairly inexpensive this entire project cost to pull off. 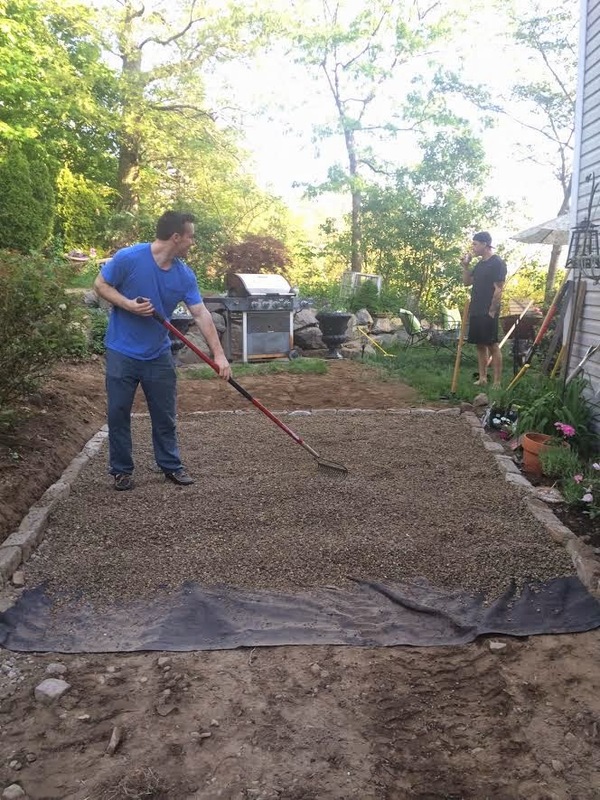 After the gravel, the furniture went into position with a big umbrella. I have always like the look of out side lighting, especially the bistro lights that swing in a casual way from poles or trees. 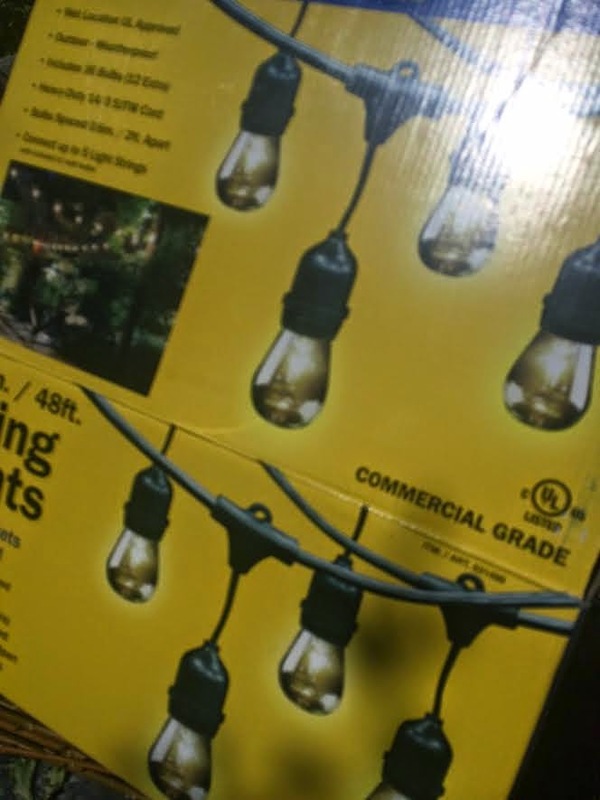 This set of lights came from Costco and was of the industrial variety. One strand would span 48 feet which would be plenty to give our little courtyard coverage. 48 feet of commercial grade lighting from Costco. that I was aiming for. Then it was time to install the lights, which we did by following an awesome tutorial on another blog, which I will link to at the end of this post. It was super simple and inexpensive. In one weeks time we have created this neat little space at the back of the house which has become quite the little gathering spot for our family. Who knew?! 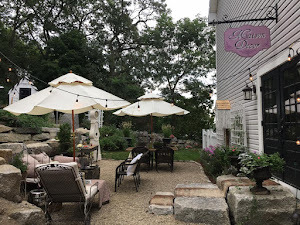 At dusk yesterday, with our outdoor lights turned on to usher in the cool of the Memorial Day weekend, some of our kids started showing up and joined me and Mr. Maison Decor in an impromptu gathering under the umbrella. Some nachos and chips and margaritas were served up to christen the new dining spot. All unplanned, and oh so relaxing. 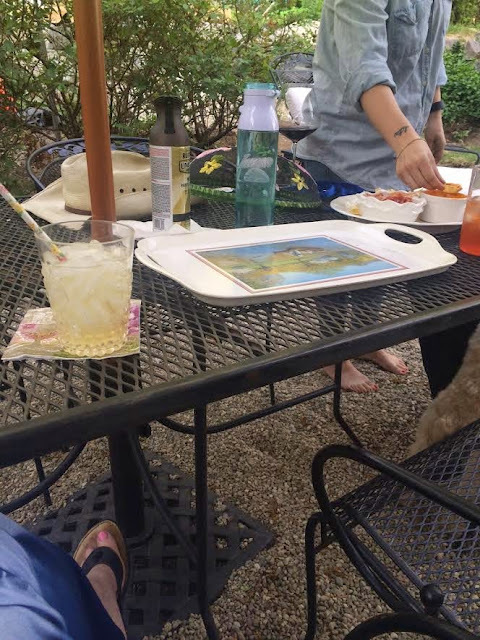 It was fun and laid back and it felt like we were all away on vacation somewhere! Today I had the time to set it up for a holiday afternoon cookout. The strands of lights really make it special, and the pea stone makes it feel very European. 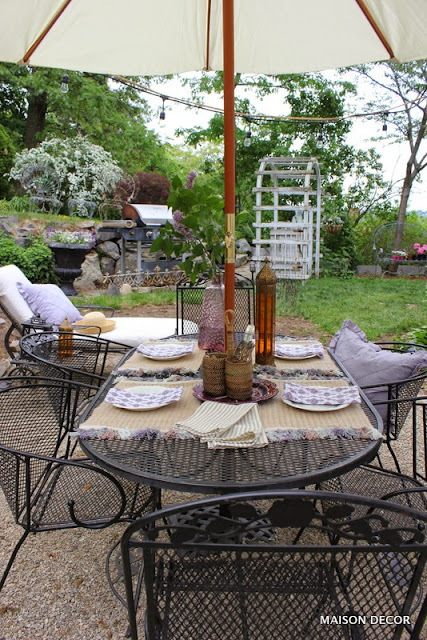 Mellow colors of beige, white and lavender are in the garden and used for the table setting. 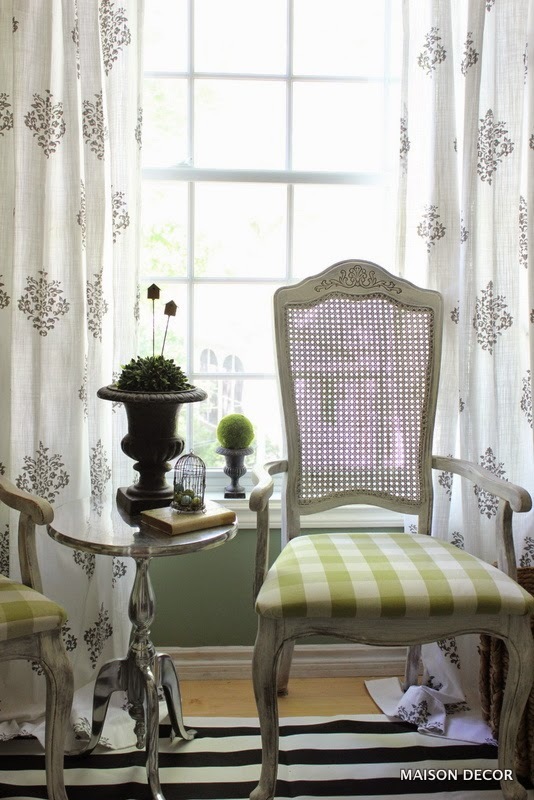 I tend to go for these softer muted shades, and I scored on finding just the right linens and tableware at HomeGoods. Bring your indoor pillows outside for any party and take them back in when you have finished. 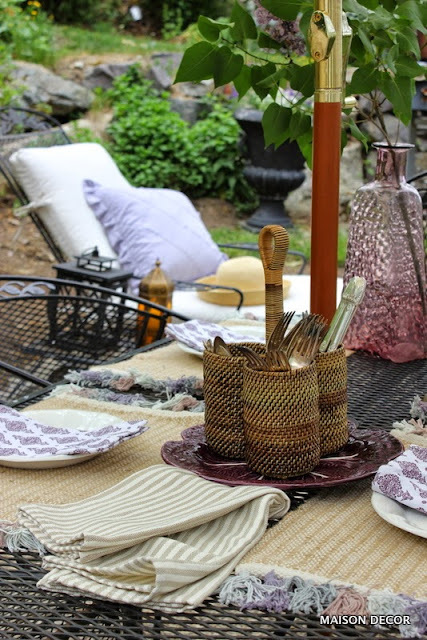 Its an easy way to get different looks for those alfresco dinner parties. This year I bought a white Sunbrella chaise lounge cushion so I could change the mood with the toss of a pillow. 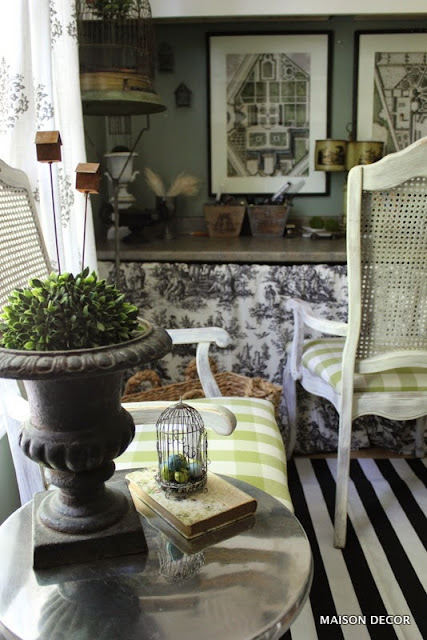 I plan to make some black and white cabana striped pillows next week. However look how pretty the cotton purple pillow from HomeGoods looks on the chaise. Playing it up with napkins and place mats in the same color palette makes it all feel like fine dining in a country setting. 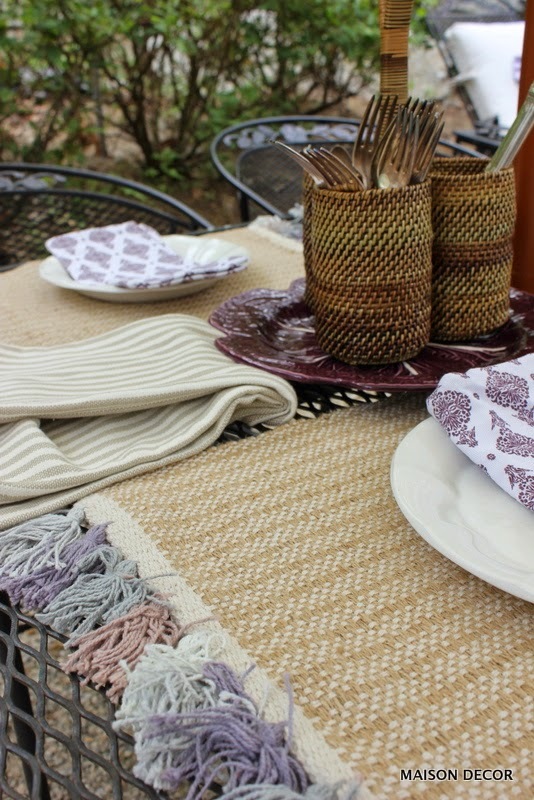 Rustic jute place mats with cotton tassels and the woven silverware caddy sitting on a plum colored lettuce leaf plate all work together to add interest by using texture. Texture is important when you neutrals in decor. So if you feel your setting is missing something, ask yourself~is there any texture? A large cutting of a remaining lilac branch is set in an amethyst glass vessel for the garden centerpiece. Fresh flowers always make a table feel special. 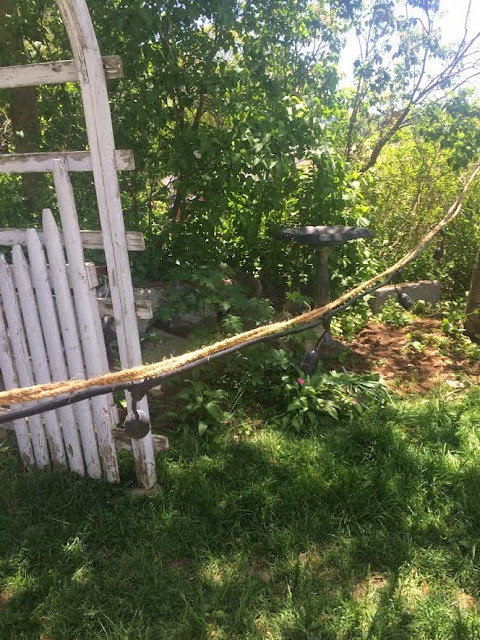 Don't have to run to the market however, you can just look in your own back yard and cut branches, flowering or not. My favorite colors of soft grey, beige and lavender feel right at home outside. And look at all those textures! The next part of the project is installing a set of french doors on the outside of the house. See that window over there....that is going to become our backdoor. 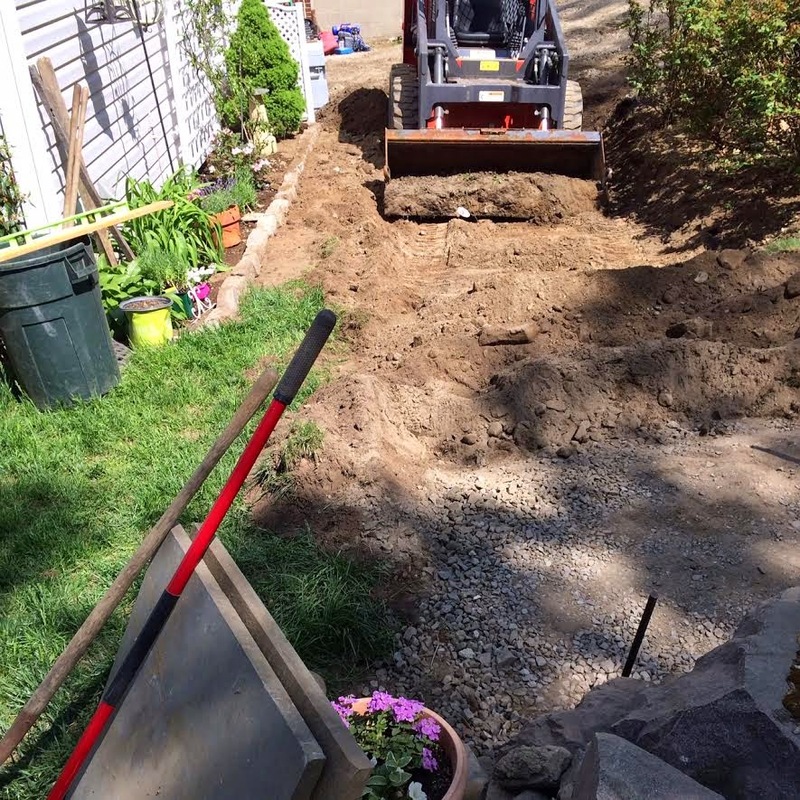 A set of French doors and a few granite steps will lead right out here. the front of the house all the way around the back. To read an awesome tutorial on how this couple installed their back yard string lights, click here. This is exactly what hubs and I did, except we skipped the spray painting step. 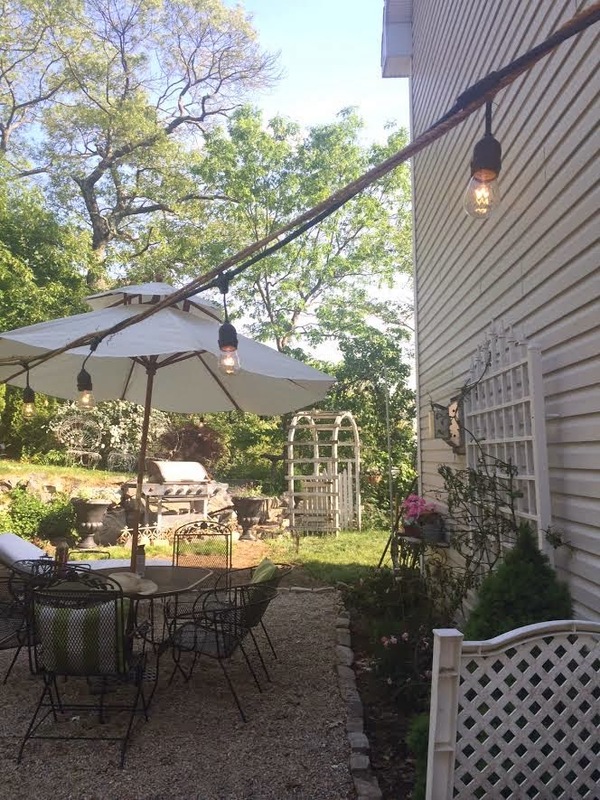 So if you want the look of bistro lights in your yard, it doesn't get any easier or inexpensive that following this how-to. 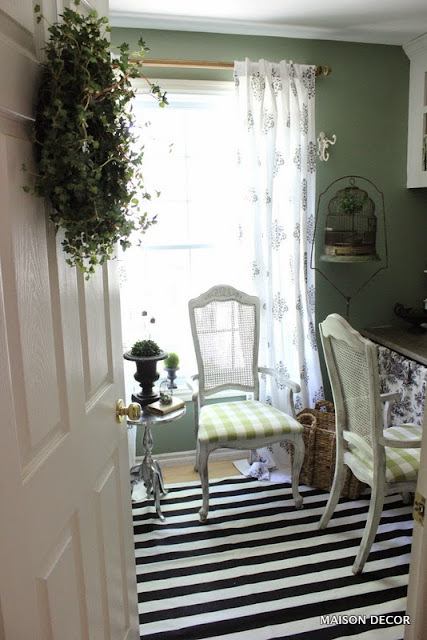 A Garden Theme Home Office. retired from the shopkeepers life, this is where I have put down roots. came to mind and that was essentially my inspiration point. 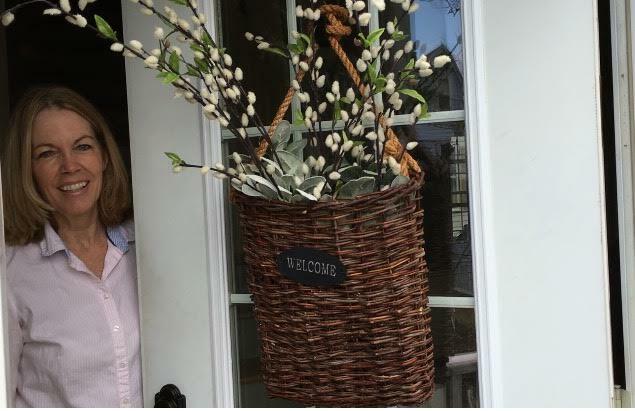 And since I love gardening and I had lots of garden type accessories that helped seal the deal. 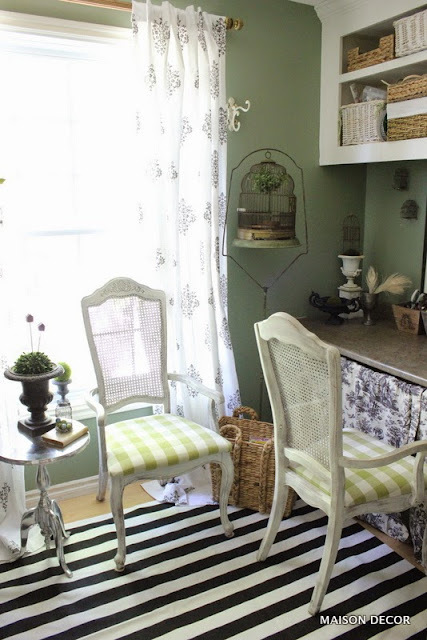 Green and black and white would be the color palette in this space. 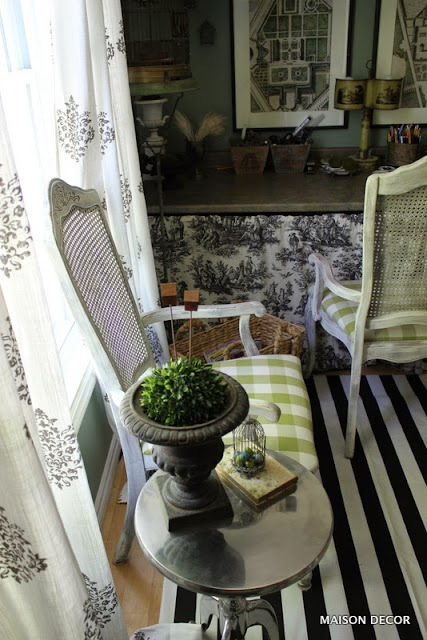 as a floor covering in a spot that doesn't get a lot of use. and have green and white buffalo check upholstery, they fit the palette. here with hubby in the morning with a cup of coffee as we go over bills. Black and white and green. 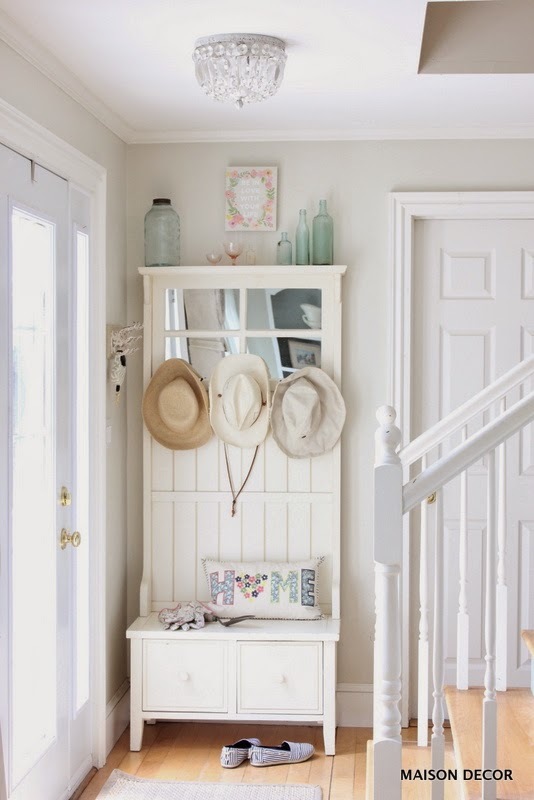 Pick a simple color palette like neutrals plus one color is almost a foolproof way to decorate a room. 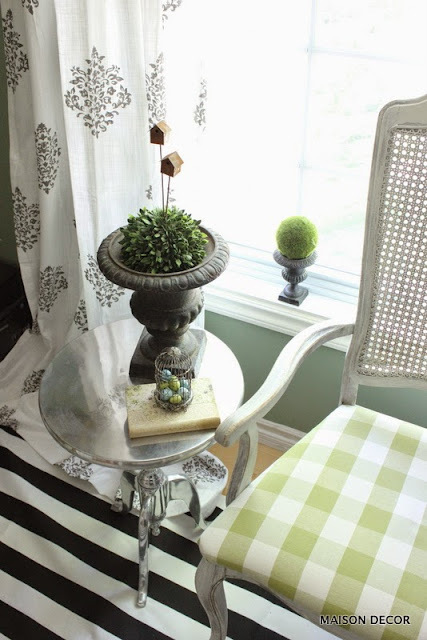 Faux moss balls and old urns in different sizes are used for table top and window sill decor. So make your extra room come alive with a fun theme and a simple color palette. items to get a look all your own. The bird cage from Brimfield found its way up here too! 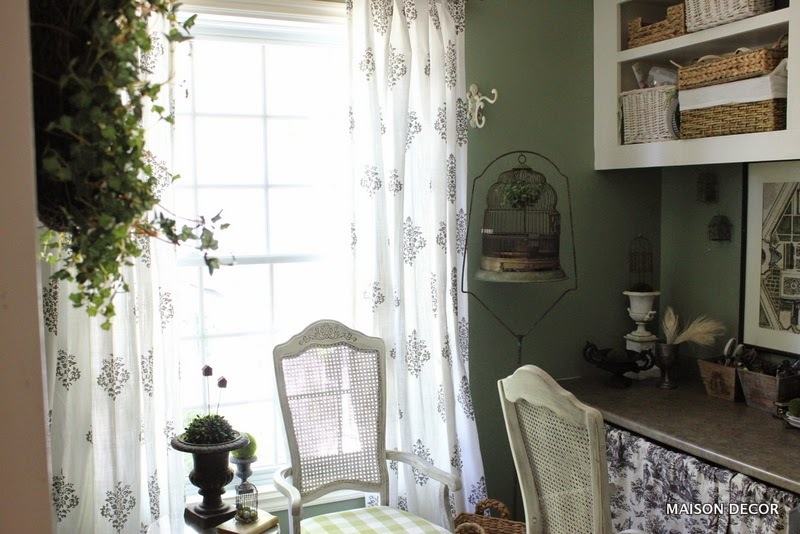 Little accents with the garden theme are sprinkled around the room. If it could be found in a garden it can be found in this room. 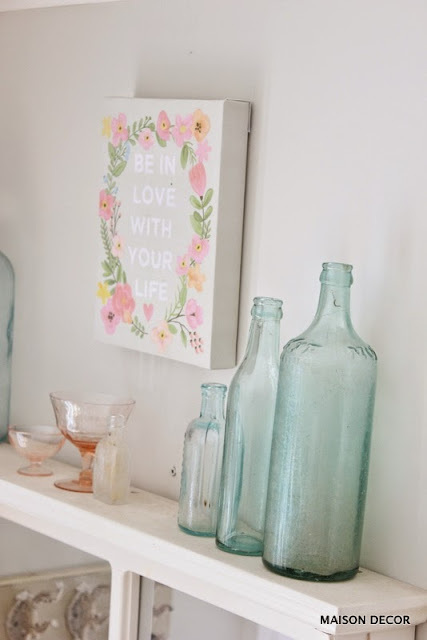 Picking a theme to help you come up with decorating ideas is always a good idea. 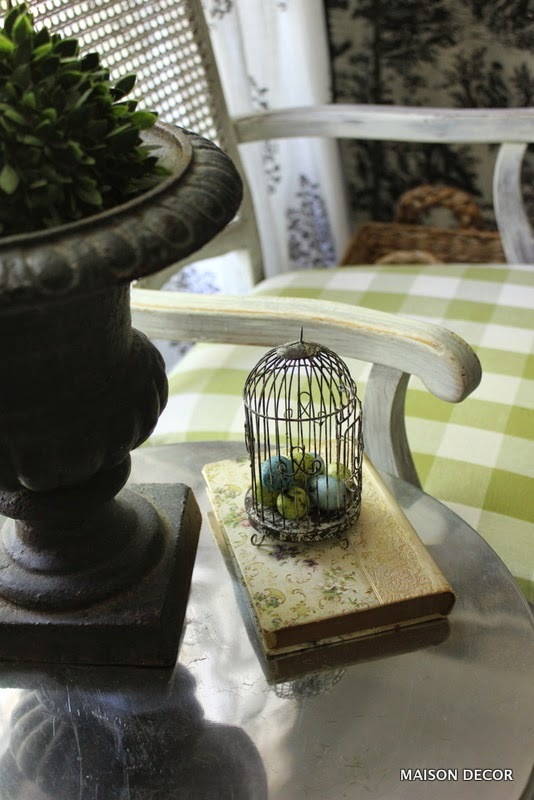 It might seem silly to put bird eggs or mossy urns in an interior room, but when all are combined, the theme pulls it together. A pretty miniature book with a fancy design in a lacy floral print with a golden spine elevates the birdcage, filled with tiny eggs. changing out the light fixture, but for now its coming along nicely. Often all it takes is one image that sets my mind to thinking. 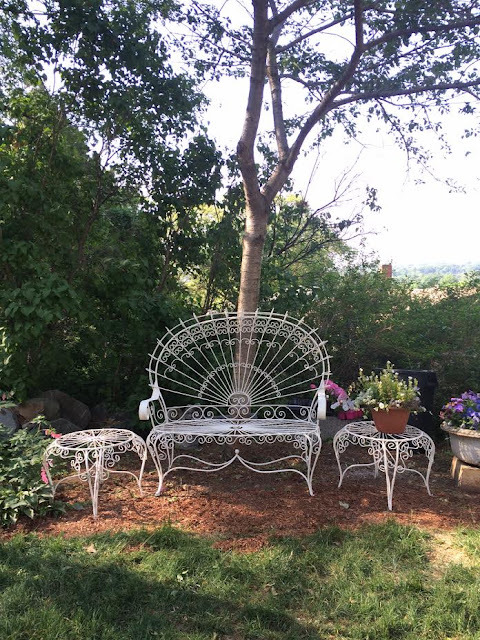 photos I collected when I was imagining my outdoor space. and the vibe of the European country lifestyle I admire. Making such a space in our own yard would be my intention. One designated for outdoor dining or early morning cups of coffee. 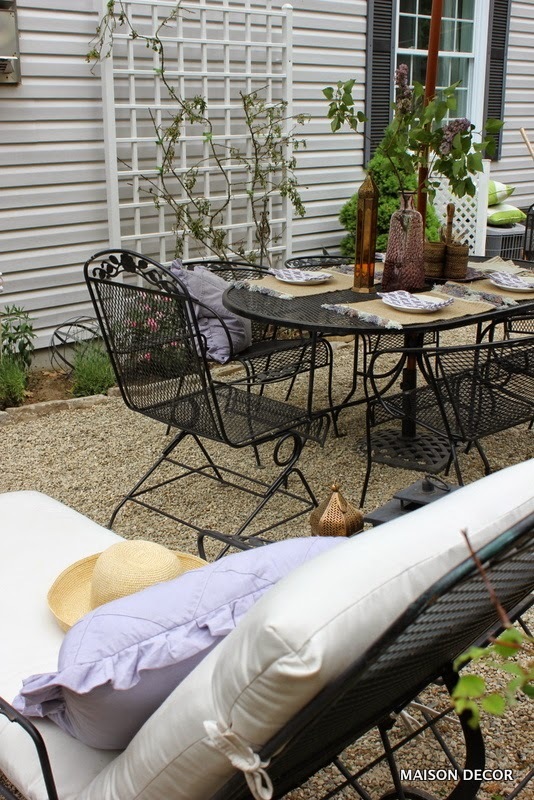 The rear of our home has just such a space that I though would convert nicely to this idea of a French courtyard. I had piles of cobblestones just waiting for me to use them, and so this weekend it all came together. 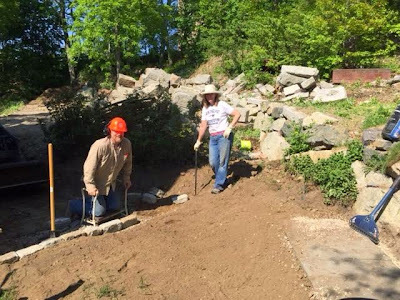 Although I started the project on Saturday, and did a lot of back breaking handwork and digging, Mr. Maison Decor came to the rescue on Sunday with his dump truck and skid steer and made my dreams come true very quickly! 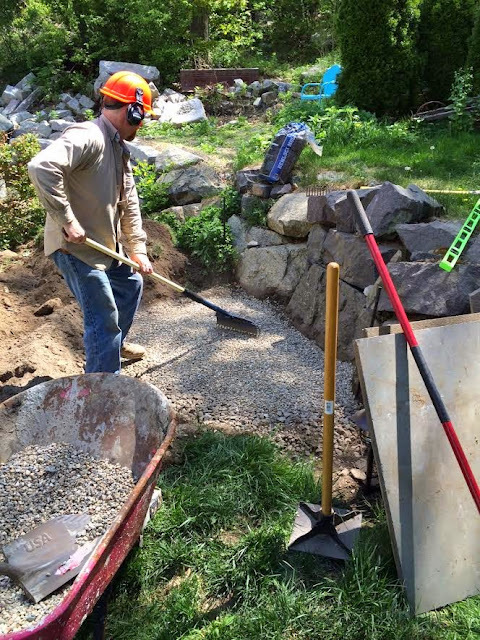 He has an excavation business and its super handy at times like these to have this equipment and knowledge of how to set the stone and all that. 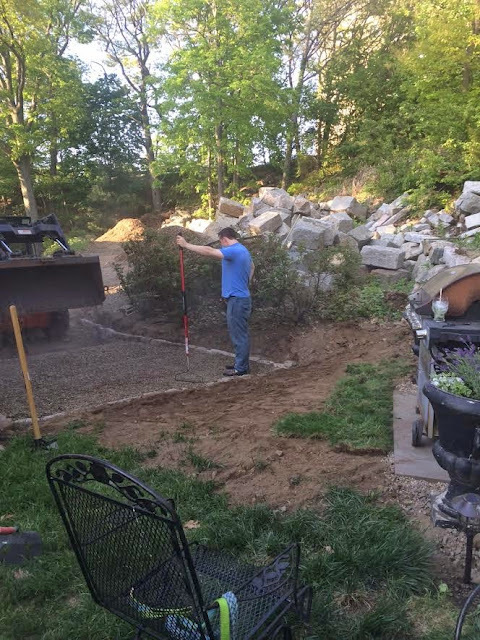 He first removed the grass that was growing in the courtyard area. We leveled out a space in front of one of the stone walls to create a dedicated grilling area. of blue stone for the grill to rest upon. This is me supervising hubby. He was doing an amazing job! 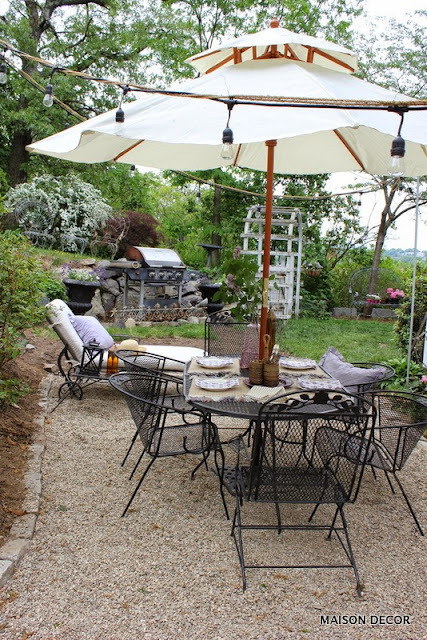 was perfect for the grill and my two large black urns were dragged over to their new spot. I have taken those urns everywhere I go! One was even in front of my old shop. and add some mortar behind the cobbles to secure them. One more thing that is headed to the courtyard! 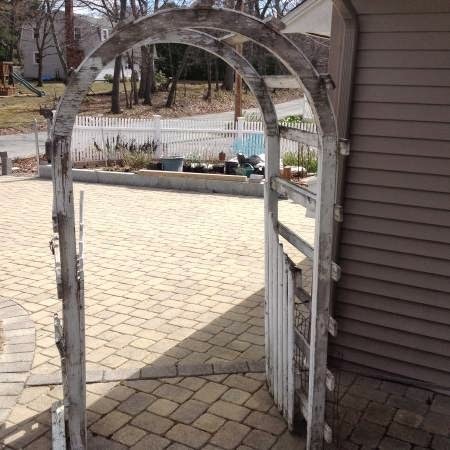 I found it on Craigslist and it is an antique garden arbor. picking it up today! Look for another exciting courtyard post tomorrow!! At least I am excited, lol. Its the little things in life that get me that way.